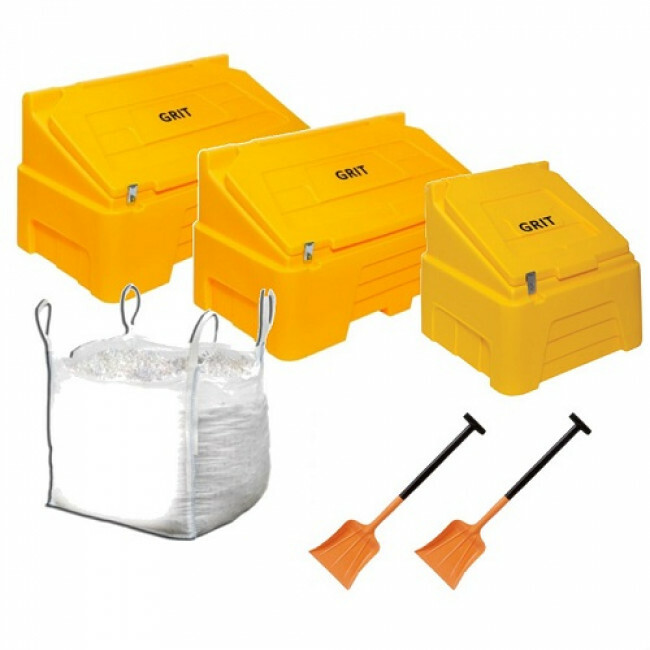 The grit bins are manufactured from tough and durable polyethylene and are fitted with an electro plated hasp and staple. The bin also has ‘GRIT’ moulded in to the lid – this is a graphic that is applied to the tool at the moulding stage and is therefore an integral part of moulding so will not scratch off. The grit bins are designed with an angled lid to minimise the amount of snow and ice settling on the top of the bin, ensuring easy use throughout winter. The angled lid also allows any rainwater to run off the bin. The white rock salt is supplied in a 1 tonne bag and is clean to use, leaving no dirty residue to be trodden into carpets in buildings or vehicles. After a winter season there is no residue to sweep up and no drains to be cleared. Our white rock salt is carefully screened to produce the most effective spread pattern, increasing pedestrian safety and the working life of equipment. The salt is harvested from a sustainable source in the Mediterranean Sea. The small snow shovels feature reinforced T-grips and have been specifically designed for clearing snow and ice. The shovel is manufactured from rust free polyethylene and is stronger than traditional wooden or metal shovels.